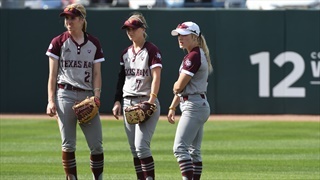 The A&M softball team was swept by No. 6 Florida last weekend at Davis Diamond. 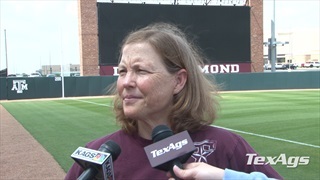 On Wednesday, head coach Jo Evans and select A&M players met with the media discuss this weekend's three-game series at Mizzou. 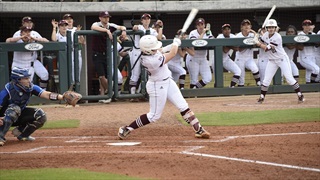 The Aggie softball was unable to bounce back from Friday night's loss to Florida, losing again to the Gators, 8-3. The power hitting of the Gator lineup proved to be too much for Texas A&M to overcome. Texas A&M allowed seven runs in the first inning to the Florida Gators which ensured a Friday night loss. Despite a hard fought comeback, the Ags couldn't complete the rally, losing 8-6. 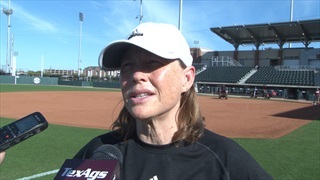 The Texas A&M softball team lost two out of three against Georgia last weekend and will look to get back on track in SEC play when Florida comes to town this weekend for a three game series at Davis Diamond. 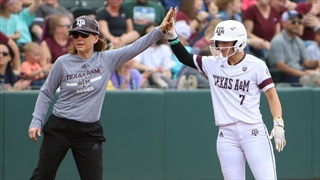 The Aggies are riding a wave of momentum after sweeping Texas Southern in a double header and extending the winning to seven games. 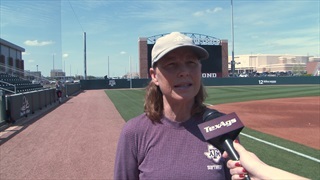 Evans and the Aggies met with the media on Thursday to discuss their upcoming trip to Athens. 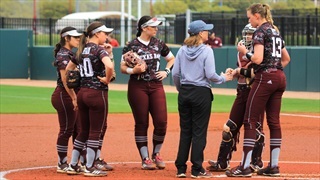 The Aggie softball team won both games they played against Texas Southern on Tuesday by scores of 8-1 and 13-2. The team had solid production on offense and defense, and will look to keep the momentum alive moving into their next SEC series this weekend. 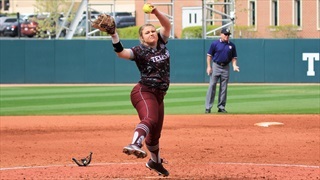 TexAgs presents a full photo gallery from Aggie softball's doubleheader against Texas Southern. TexAgs presents a full gallery of action from Texas A&M's sweep of the BYU Cougars over the weekend. 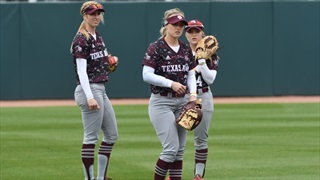 Sharp defense and timely hitting from the A&M bats allowed Texas A&M to earn a 4-0 victory on Saturday and sweep the Cougars of BYU over the weekend. 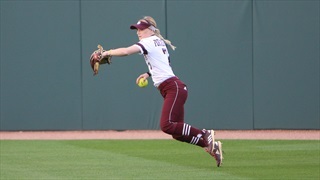 The Aggies will look to carry their gold glove performance back into SEC play. 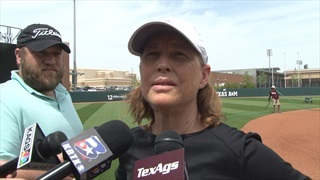 A&M head softball coach Jo Evans reached a monumental milestone on Friday night at Davis Diamond as she notched her 900th career win at Texas A&M. 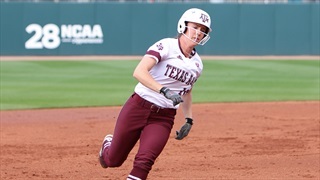 The Aggies' late rally propelled them to a 3-2 win. 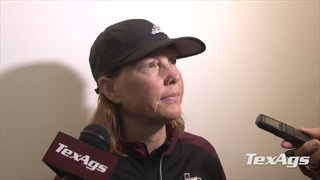 The Texas A&M softball team had a late game rally to come from behind and defeat the Bearkats in the second game of their Wednesday doubleheader. With the win, the Aggies added on to a win streak that they'll look to continue moving forward. 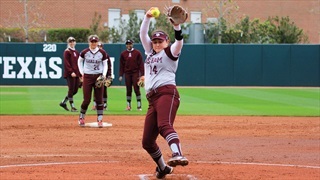 The Aggies won the first game of their doubleheader against the Sam Houston State Bearkats on Wednesday behind a strong pitching performance from Payton McBride and a solid offensive performance from Baylee Klinger. 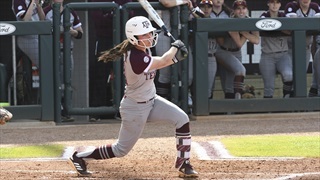 Payton McBride hit a walk-off single to lead the Aggies to a 4-3 win over Alabama on Sunday. The A&M win put an end to Alabama's 33-0 start, the third best start to a season in NCAA softball history. 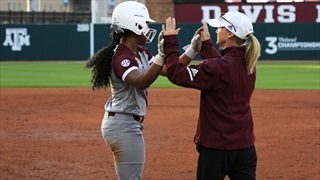 The Texas A&M softball team struggled again on Saturday, getting run ruled by the Crimson Tide after just 5 innings. 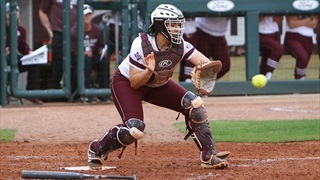 The Aggies struggled both on the rubber and at the plate throughout the day, and the team wasn't able to do much to slow down Alabama. Texas A&M is looking to rebound in the SEC standings after being swept by Auburn a week ago. This weekend, the Aggies host the red hot Crimson Tide, but feel they are equipped to end Alabama's winning streak. After 14 scoreless innings, Kelly Martinez broke up the shutout at Davis Diamond with a two-run shot to left field. Kendall Potts notched the win after allowing just four hits and fanning nine in a nine innings in the circle. Kelly Martinez's two-run shot in the bottom of the 15th lifted the Aggies over SFA in walkoff fashion on Wednesday night. TexAgs provides a full photo gallery from the extended-inning game.